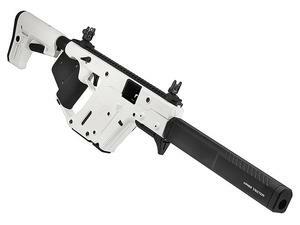 The KRISS Vector CRB Gen 2 is a 16″ barrel semi-auto version of the KRISS Vector SMG. The KRISS Vector CRB shares the same milspec frame, Super V operating system, materials and rugged housing as the KRISS Vector SMG. Same light weight. Same maneuverability. Same simple and easy to maintain Super V mechanism that reduces felt recoil by more than 60% and reduces barrel elevation by more than 95%. The latest generation of KRISS Vectors offer caliber interchangeability, tool-less disassembly offers quick caliber changes. Dim. / Wt	Length 38-1/2" Extended, 35" Collapsed, Height: 6.8", Weight (unloaded w/o accessories): 8.02 lbs.